January 12, 2018, 9:00 AM · Over the last week there has been a lot of discussion about an incident in which a viola da gamba was destroyed when it was put in the cargo hold on Alitalia airlines last week. Was it the airline's fault, for handling the item so roughly? Was it the owner's fault, for failing to purchase a ticket for the instrument and then allowing it to be put in cargo? A combination? Violinists and violists generally do not have to purchase an extra ticket for their instruments; we fly with the hope (and sometimes we can arrange more of a guarantee) that there will be room in an overhead compartment. But it doesn't always happen, and on occasion violinists have been told they must put their instruments in the cargo hold. Whether one says "yes" to that depends on a number of things: the value and age of the instrument; the case it's in; and generally weighing the risk of damage to the considerable inconvenience of missing a flight. People have missed flights to protect instruments: recently a violinist named Alex "Sasha" Petrin completely missed a flight - and missed the gig - to protect his 2008 Boris Sverdlik violin; and violinist Rachel Barton Pine also missed a flight to protect her 1742 Joseph Guarneri "del Gesu." In general, the risk, when it comes to cargo, is both the low temperature and the fact, no matter what is promised, that there is likely to be some rough handling and possibly the instrument would be put through some baggage transport machinery. Despite the risks, it takes some serious resolve and inconvenience to actually miss a flight. For this week's vote, imagine yourself in the position of having to miss a flight -- spend a night at the airport or find other accommodations and then hope they'll let you on with the instrument later -- in order to keep your instrument from being put in the cargo hold. Would you do it? Please participate in the vote, and then share your thoughts and experiences about the matter in the comments section. January 12, 2018 at 04:09 PM · Blame the victim? No. What I read is they promised that the gamba would be handled carefully. January 12, 2018 at 04:15 PM · I've never had to face this. I've traveled a handful of times with my violin or viola and I've always been able to take it into the cabin and put it in the overhead bin. When I moved across the country, I brought my viola on the plane and shipped my violin (with my furniture and other possessions) because I was planning to practice the viola right after I landed, for an audition. I didn't have immediate plans for the violin, though, and it is an easily-replaced factory instrument from Shar. My violin arrived 2 weeks later, as planned, in perfect condition. It wasn't even out of tune. It used to be that I would definitely risk it in cargo because my instruments are mass produced and not worth much more than plane tickets, but the more recent stories have given me pause even for that. If I had valuable instruments like the pros, I would definitely miss a flight. January 12, 2018 at 04:22 PM · I would give them the case with the bows, but hold the instrument in my hand as carry-on. January 12, 2018 at 04:28 PM · I have a decent cheap instrument I can take instead of a valuable one. The financial cost would be no worse than a broken camera. January 12, 2018 at 05:42 PM · I voted the second answer, "I never fly with my instrument," because I don't fly anymore -- with or without an instrument. I've already given the reasons for my decision on my WordPress page. The Herzog story, and others like it, give me still more reasons to stay on the ground -- and more reasons to be glad I didn't go into the music business. As a student, I flew a fair number of times with my instrument between the Lower Peninsula of Michigan and Chicago. No hassles, no hitches -- I had the instrument right with me all the time. Of course, this was before 9/11 -- security was un-intrusive and took about 10 seconds. Didn't time any flights, but I doubt any of them lasted over 45 minutes. January 12, 2018 at 05:58 PM · Never flown with a violin before, though I've had friends who had success flying with violins via China airlines. January 12, 2018 at 08:52 PM · I would take the violin out of the case, check the case with bows in with the ticket agent, and take the violin on the plane with a DIY ukelele case. https://www.youtube.com/watch?v=L_jKy7bLJXw. January 12, 2018 at 10:03 PM · Like Jim Hastings, I don't fly anymore. After 12 years with Bell Labs where I was on the road more than 80% of the time, I no longer have the desire to see the inside of an airport or airplane again. I retired before 11 Sept 2001 so I never experienced the tightened regulations. I feel for the professionals who have to fly with their instruments as my experiences of baggage handling was pretty bad during my high travel years. Even though my violin has a very low financial value, it is my beloved friend. I wouldn't put my friend, my cats, or my spouse in the cargo hold. Fortunately I no longer have to travel and much prefer my home, cats and spouse to a life on the road. 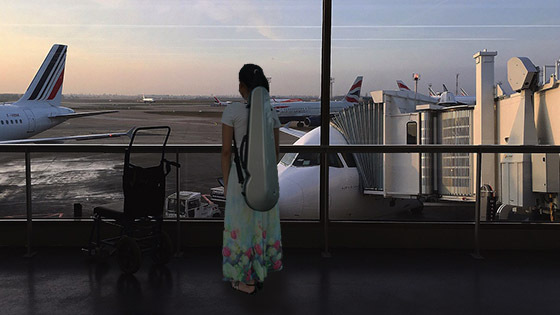 January 12, 2018 at 10:20 PM · Although a violinist, my only experience flying with an instrument was with a cello (New York to Seattle, non-stop, on Delta). After reading about the difficulties professional musicians were experiencing, I made the reservation by speaking to a representative rather than on-line. My luck was that her son played the cello! I was required to buy a window seat at the back bulkhead for the cello, next to my seat. Then, I went to the airport armed with copies of the regulations and other documentation demonstrating that it is permitted to fly with an instrument in the cabin. Thankfully, I had no problem (but I was happy to arrive at the end of the journey with the cello intact). January 13, 2018 at 12:10 AM · I fly several times a year with my violin as a carry-on, I have done so for decades, but have never had any problem whatsoever. However, if any airline insisted on putting my instrument in cargo, I would refuse to take the flight. I find these stories horrifying. I should say that Air Canada has always been helpful and accommodating, in my experience, whether on domestic or transatlantic flights. January 13, 2018 at 12:14 AM · I fly several times a year on either Delta or Alaska airlines and I've never had a problem carrying my violin case on an airplane. I do worry about it, so I do a couple of things to be proactive about the situation. As I approach the ticket agent I do my best to keep the violin case out of his or her line of sight. Next, once I step on the airplane, I ask the flight attendant to place the violin case in a safe closet or overhead compartment. They have always made certain it was somewhere safe. Indeed, my violin has occasionally flown first class while I bump around in a middle seat somewhere in the back of the airplane. However, I always carry a copy of the FAA ruling about violins that states they should be allowed in the cabin with the owner. January 13, 2018 at 01:01 AM · I answered yes, I would miss a flight to keep it with me - that's because I have had to miss a flight for those reasons. :) I've also often had it in the coat closet of first class, and on one occasion (before 9/11) the captain took it with him in the cockpit. These days I shamelessly pre-board with families with small children etc, which works well if you are REALLY nice to the gate agent and explain why. January 13, 2018 at 04:25 PM · Fortunately I have never been asked to check my violin in cargo. I usually fly American Airlines and Lufthansa. They have never given me a problem about bring my violin on the plane. I do have a BAM case in the shape of a crescent and it is very small. On one occasion the American Airlines flight was very full and I simply put it under my seat and it fits! I would never take the violin out and just check the bows with the case as my bows are worth even more than my violin! And I would definitely miss a flight to protect my violin/bows. As a professional violinist they are way to important to me to take any chances. January 13, 2018 at 05:19 PM · I THINK I'd miss the plane, so that is what I voted, but it's hard to be sure. I have never had to choose. And recently I have not been travelling to music camps, and when I visit my parents (flying with one of the most hated airlines) I now practise on my first full-size violin which is still at their place. It sounds pretty dire, but then the house is big enough for no-one to be bothered unduly by it. January 13, 2018 at 08:15 PM · I travel weekly from Florida to Chicago on American Airlines, my main violin is a very beautiful 100+ irreplaceable instrument. I have done everything I can to protect my violin, a GEWA AIR 2.0 case with an oblong Mooradian cover. The combination of the cover and case was large enough to draw attention and the gate agents frequently would ask what it is and I would tell them it is a violin and never had to check it though I often got the feeling that they were really wanting force me to check it. I always get early boarding, while there is plenty of overhead space, because of my frequent flyer status. I still would get some nasty looks from other passengers. Recently, I changed my violin case to a BAM Overhead, the smallest possible violin case with a separate bow tube. Everything was going well, until in Chicago a couple of weeks ago, the gate manager at American Airlines in Chicago said that the bow case and violin case were 2 items and one must be checked. I checked the bow case with trepidation and carried on the violin quite upset and worried about the bow. My next decision has been to switch my travel violin to a carbon fiber violin and carbon fiber bow inside the BAM Overhead with a violin shaped padded Mooradian cover with the bow tube inside. It looks like a violin case and is considerably smaller than my oblong case, draws much less attention. If my violin has to get checked, I know that the carbon fiber instrument can most likely handle both the temperature and the baggage handlers. This is the best option for me at this time. Though I am an amateur violin player, not a professional, I want to play violin everyday even if I have to travel for work. It is the best part of my day. I simply don't want to worry about my good violin anymore, it is too stressful each time I approach the gate, and wonder if today is the day where one of the airline gate agents is going to be uneducated and unkind, and ignore the DOT regulations. One word of advice to anyone who travels with an instrument, carry a copy of the DOT rules on musical instruments and pay, if necessary, to get early boarding. It is really important we keep working together with the airline industry that the front line workers understand the regulations and respect musicians and their instruments, we are the front line of culture. January 13, 2018 at 10:04 PM · I would miss the flight, no question. But usually I avoid flying with my violin, using my sister's VSO at my destination instead (most of my flying these days is to visit family). On those occasions when it's necessary to bring my own violin, I fly Southwest and pay for early bird check-in. The other airlines that fly in and out of my most frequent destination too often use commuter jets for one or more legs of my trip, and those little planes with smaller bins are where you tend to run into the biggest problems bringing a violin on board. January 14, 2018 at 03:06 AM · Whether or not the violin is valuable or even that it is a violin, Treating peoples' property in that way is wrong. anyone's luggage or property deserves more careful treatment than that. I've had my baggage destroyed, my sister had hers lost never to be found again. we've all seen videos of handlers throwing bags haphazardly and without thought. Why do we have to put up with that? why isn't the airline responsible when its obvious there was damage done? she was "assured it would be taken by hand and treated as a fragile item." It probably WAS taken by hand to the aircraft's cargo compartment, and treated well before takeoff - but the gate personnel at the originating airport have no control over what happens after that. Hard to imagine that the owner really thought that they could just bring the large instrument in the cabin without prior arrangement. Even if the flight isn't full, and there's a window seat at the bulkhead, airlines have always wanted to charge someone for occupying a seat for the entire flight. This isn't just a post-9/11 thing! January 14, 2018 at 03:17 PM · I fly only when unavoidable, and always make, arrangements to borrow instruments at destination. I have found that good shops are very kind about lending instruments if I make, arrangements in advance. Occasionally I am asked for a ccn, reasonable--I am unknown to the dealer. I've played "nice" America, German, etc. instruments under these conditions, and the change always illuminated something, whether in technique or expression. Most of my few flighted trips are long enough to make this worthwhile. I enjoy meeting dealers and instruments. January 14, 2018 at 03:27 PM · Oh sorry, I didn't know they didn't have another ticket for it. Yeah that's too big for cabin storage. January 15, 2018 at 04:10 PM · Rough handling of luggage happens and anything put on a baggage conveyors is subject to tossing, jamming and crushing. One airport has no control on what another airport does and no one can promise anything unless they are doing it themselve. The only way I would ever check my violin is if it was in its case, which in turn in safely stored in a strong transport Pelican case, and I have an instrument that is replaceable and well insured for that mode of transportation. January 15, 2018 at 10:39 PM · I've flown a number of times with my violin (worth about as much as my car), mostly US flights but a couple overseas, and never had problems with carrying it on. Precautions I take: I travel with the violin in a shaped case rather than my normal oblong case, with no accessories that the TSA might not be familiar with (I was pulled aside once because they didn't know what my rubber practice mute was...); if I'm traveling on an airline like Southwest without assigned seating I pay extra for priority boarding if I can and if I'm on an airline with assigned seating I choose my seats so I can board in the first group. I try to ascertain what model of plane they're using and verify it has carry-on bins; I also watch out for super-economy fares that don't allow carry-on luggage--I almost got caught by that traveling to my last out of town gig because someone else was making the arrangements but fortunately I checked restrictions before the flight was booked and was able to get something else. I do have my violin insured but there's still no way I'd trust the airlines to gate-check it. January 18, 2018 at 01:46 PM · I've flown frequently with a violin, but like others try to get priority boarding of some sort. I would take another flight if necessary but never have had to. Recently a flight attendant asked if they could put the violin in the front closet (they usually just hang a few attendant uniforms there). It was already up in the bin but some other person was trying to stuff something in later. That was fine by me. That is always an option to ask for if necessary. Another time, I flew internationally with everyone trying to carry many things onboard, and had a bad boarding order. The attendant saw the violin, and just motioned to the space between a rear bulkhead wall and the last row of seats. It actually fit well, and this space never occurred to me as an option. This was a larger plane, but that might be something to consider as a last option, assuming it works for other planes.